This article is about the novel. For the 1990 film, see The Bonfire of the Vanities (film). For the historical event, see Bonfire of the Vanities. 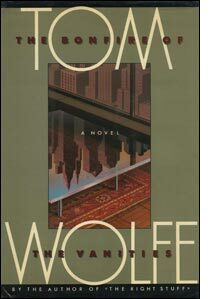 The Bonfire of the Vanities is a 1987 satirical novel by Tom Wolfe. The story is a drama about ambition, racism, social class, politics, and greed in 1980s New York City and centers on three main characters: WASP bond trader Sherman McCoy, Jewish assistant district attorney Larry Kramer, and British expatriate journalist Peter Fallow. The novel was originally conceived as a serial in the style of Charles Dickens' writings; it ran in 27 installments in Rolling Stone starting in 1984. Wolfe heavily revised it before it was published in book form. The novel was a bestseller and a phenomenal success, even in comparison with Wolfe's other books. It has often been called the quintessential novel of the 1980s. The title is a reference to the historical Bonfire of the Vanities, which happened in 1497 in Florence, Italy, when the city was under the rule of the Dominican priest Girolamo Savonarola, who ordered the burning of objects that church authorities considered sinful, such as cosmetics, mirrors, books and art. Wolfe intended his novel to capture the essence of New York City in the 1980s. Wall Street in the 1980s was newly resurgent after most of the previous decade had been bad for stocks. The excesses of Wall Street's big players were at the forefront of the popular imagination, captured in films like Oliver Stone's Wall Street, novels like Bret Easton Ellis' American Psycho, and in non-fiction books like Liar's Poker, Den of Thieves, and Barbarians at the Gate. Beneath Wall Street's success, the city was a hotbed of racial and cultural tension. Homelessness and crime in the city were growing. Several high-profile racial incidents polarized the city, particularly two black men who were murdered in white neighborhoods: Willie Turks, who was murdered in the Gravesend section of Brooklyn in 1982, and Michael Griffith in Howard Beach, Queens, in 1986. In another episode that became a subject of much media attention, Bernhard Goetz became something of a folk-hero in the city for shooting a group of black men who tried to rob him in the subway in 1984. Burton B. Roberts, a Bronx judge known for his no-nonsense imperious handling of cases in his courtroom, became the model for the character of Myron Kovitsky in the book. Throughout his early career, Wolfe had planned to write a novel that would capture the wide spectrum of American society. Among his models was William Makepeace Thackeray's Vanity Fair, which described the society of 19th century England. Wolfe remained occupied writing nonfiction books on his own and contributing to Harper's until 1981, when he ceased his other projects to work on the novel. Wolfe began researching the novel by observing cases at the Manhattan Criminal Court and shadowing members of the Bronx homicide squad. To overcome a case of writer's block, Wolfe wrote to Jann Wenner, editor of Rolling Stone, to propose an idea drawn from Charles Dickens and Thackeray. The Victorian writers whom Wolfe viewed as his models had often written their novels in serial installments. Wenner offered Wolfe around $200,000 to serialize his work. The deadline pressure gave him the motivation he had hoped for, and from July 1984 to August 1985 each biweekly issue of Rolling Stone contained a new installment. Wolfe was not happy with his "very public first draft", and thoroughly revised his work. Even Sherman McCoy, the central character of the novel, changed—originally a writer, in the book version he is cast as a bond salesman. (Wolfe came up with the revised occupation after spending a day on the government-bond desk of Salomon Brothers, with many of the traders who later founded the notorious hedge fund Long-Term Capital Management.) Wolfe researched and revised for two years. The Bonfire of the Vanities appeared in 1987. The book was a commercial and critical success, spending weeks on bestseller lists and earning praise from much of the literary establishment on which Wolfe had long heaped scorn. The story centers on Sherman McCoy, a successful New York City bond trader. His $3 million Park Avenue co-op, combined with his aristocratic wife's extravagances and other expenses required to keep up appearances are depleting his great income, or as Sherman calls it, a "hemorrhaging of money". McCoy's secure life as a self-regarded "Master of The Universe" on Wall Street is gradually destroyed when he and his mistress, Maria Ruskin, accidentally enter the Bronx at night while they are driving back to Manhattan from Kennedy Airport. Finding the ramp back to the highway blocked by trash cans and a tire, McCoy exits the car to clear the way. Approached by two black men whom they perceive—uncertainly, in McCoy's case—as predators, McCoy and Ruskin flee. After Ruskin takes the wheel of the car to race away, it fishtails, apparently striking one of the two would-be assailants—a "skinny boy". Peter Fallow, a has-been, alcoholic journalist for the tabloid City Light, is soon given the opportunity of a lifetime when he is persuaded to write a series of articles about Henry Lamb, a black youth who has allegedly been the victim of a hit and run by a wealthy white driver. Fallow cynically tolerates the manipulations of Reverend Bacon, a Harlem religious and political leader who sees the hospitalized youth as a "projects success story gone wrong". Fallow's series of articles on the matter ignites a series of protests and media coverage of the Lamb case. Up for re-election and accused of foot-dragging in the Lamb case, the media-obsessed Bronx County District Attorney Abe Weiss pushes for McCoy's arrest. The evidence includes McCoy's car (which matches the description of the vehicle involved in the alleged hit and run), plus McCoy's evasive response to police questioning. The arrest all but ruins McCoy; distraction at work causes him to flub on finding an investor for a $600 million bond on which he had pegged all his hopes of retiring the mortgage on his home and covering his family costs. While McCoy is getting a dressing down from his boss for failing to sell the bond, his lawyer, Tommy Killian, calls to tell him of his upcoming arrest, forcing him to admit his legal problems to his boss and being given a leave of absence as a result. McCoy's upper class friends ostracize him, and his wife leaves him and takes their daughter Campbell (McCoy's only source of genuine family love) to live with his parents. Hoping to impress his boss as well as an attractive former juror, Shelly Thomas, Assistant District Attorney Larry Kramer aggressively prosecutes the case, opening with an unsuccessful bid to set McCoy's bail at $250,000. Released on $10,000 bail, McCoy is besieged by demonstrators who are protesting outside his home. Fallow hears a rumor that Maria Ruskin was at the wheel of McCoy's car when it allegedly struck Lamb, but has fled the country. Trying to smoke out the truth, on the pretense of interviewing the rich and famous, Fallow meets with her husband, Arthur, at a pricey French restaurant. While recounting his life, Arthur has a fatal seizure, as disturbed patrons and an annoyed maître d'hôtel look on. Ruskin is forced to return to the United States for his funeral, where McCoy confronts her about being "the only witness". Fallow, spying on Maria, overhears that she, not Sherman, was driving. Fallow's write-up of the association between Sherman McCoy and Maria Ruskin prompts Assistant D.A. Kramer to offer her a deal: corroborate the other witness and receive immunity, or be treated as an accomplice. Ruskin recounts this to McCoy while he is wearing a wire. When a private investigator employed by Killian discovers a recording of a conversation that contradicts Ruskin's statement to the grand jury, the judge assigned to the case declares her testimony "tainted" and dismisses the case. If this case was being tried in foro conscientiae [in the court of the conscience], the defendants would be Abe Weiss, Reginald Bacon, and Peter Fallow of The City Light. Bonfire was Wolfe's first novel. Wolfe's prior works were mostly non-fiction journalistic articles and books. His earlier short stories appeared in his collection Mauve Gloves & Madmen, Clutter & Vine. According to Wolfe, the characters are composites of many individuals and cultural observations. However, some characters were based on real people. Wolfe has acknowledged the character of Tommy Killian is based on New York lawyer Edward Hayes, to whom the book is dedicated. The character of the Reverend Bacon is considered by many to be based on the Reverends Al Sharpton and/or Jesse Jackson, who have both campaigned under the banner of eliminating racism. In 2007, on the book's 20th anniversary of publication, The New York Times published a retrospective on how the city had changed since Wolfe's novel. The book was a major bestseller, and also received strong reviews. The New York Times praised the book, saying it was "a big, bitter, funny, craftily plotted book that grabs you by the lapels and won't let go", but criticized its sometimes superficial characters, saying when "the book is over, there is an odd aftertaste, not entirely pleasant." In 1990, Bonfire was adapted into a film starring Tom Hanks as Sherman McCoy, Kim Cattrall as his wife Judy, Melanie Griffith as his mistress Maria, and Bruce Willis as journalist (and narrator of the film) Peter Fallow. The screenplay was written by Michael Cristofer. Wolfe was paid $750,000 for the rights. The film, however, was a commercial and critical flop. An opera adaptation, with music by Stefania de Kenessey and libretto and direction by Michael Bergmann, premiered in New York on October 9, 2015. ^ Hoby, Hermione (10 January 2010). "The Bonfire of the Vanities by Tom Wolfe". The Guardian. Retrieved 29 October 2014. ^ McFadden, Robert D. "Tom Wolfe’s Model Justice Dies at 88", The New York Times, October 24, 2010. Accessed October 24, 2010. ^ Taylor, John (21 March 1988) "The Book on Tom Wolfe", New York Magazine. In Scura 1990, p. 263. ^ Barnard, Anne. "No Longer the City of 'Bonfire' in Flames". The New York Times, December 10, 2007. Retrieved on January 13, 2008. ^ Sutherland, John (18 February 1988). "Big Bad Wolfe". London Review of Books. 10 (4): 15–16. Retrieved 29 October 2014. ^ Conroy, Frank (1 November 1987). "Urban Rats in Fashion's Maze". New York Times. Retrieved 29 October 2014. ^ Chow, Andrew R. "'The Bonfire of the Vanities' Gets Opera Adaptation". Retrieved 2015-09-12. ^ Schwindt, Oriana. "Chuck Lorre's 'Bonfire of the Vanities' Series in Development at Amazon". Retrieved 2016-10-14.